Conson, the first tropical storm of the year in Vietnam, might approach the northern coast and make landfall in Quang Ninh and Hai Phong provinces on July 17, the National Hydro Meteorological Forecasting Center has said. As of 7am on July 16, the storm was centered at approximately 17.1 degrees north latitude and 111 degrees east longitude on the waters off the Hoang Sa (Paracel) Islands, 630 kilometers southeast away from provinces extending from Hai Phong to Nghe An. Strongest winds near the storm center peaked at 103-133 kilometers an hour with gusts topping 149 kilometers per hour. 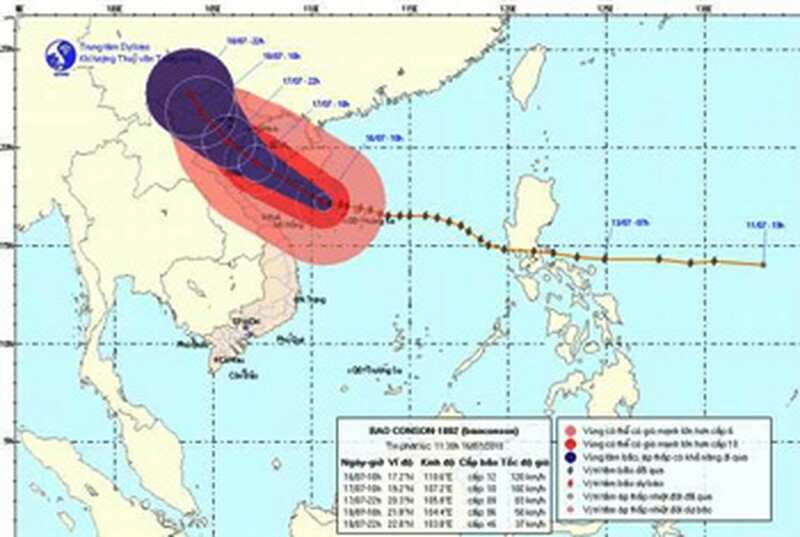 The center director Bui Minh Tang said that with this movement, Typhoon Conson would make landfall on China’s Hainan Island and then move straight to the Gulf of Tonkin on July 16. The storm then will approach the Vietnamese coast at Mong Cai Town in Quang Ninh Province on July 17, Tang said. All coastal provinces from Ninh Binh to Quang Ninh should prepare for the storm’s devastation, he warned. Affected by the storm, the Gulf of Tonkin has been forecast to experience strong winds by early July 16 with Co To and Bach Long Vy Islands being the first affected areas. Meantime, the northern mainland will suffer sustained winds of around 39-61 kilometers an hour, forecast to intensify as the typhoon nears the shore. 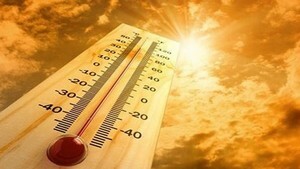 The northern region will see heavy rains from July 16 to 18. Northern mountainous provinces like Ha Giang, Lao Cai, Lang Son, and Cao Bang should prepare to cope with prone flash floods and landslides triggered by heavy rains. The Central Steering Committee on Flood and Storm Prevention has ordered authorities in coastal provinces from Quang Ninh to Thanh Hoa to call all boats ashore and ban them from returning to sea to prevent danger to lives and property. According to the Border Guard High Command, three Quang Nam Province fishing boats have yet to be contacted by the mainland, while 33 Quang Ngai Province boats have not moved out of the waters near Hoang Sa Island despite warnings delivered by officials.